Ok, I didn't see this coming, especially in the first wave of posthumous archive releases by guitarist, singer, session-man and performer Glen Campbell (RIP). 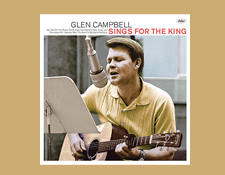 The short story underlying Glen Campbell Sings For The King is that back in the day, apparently, a producer/writer for Elvis Presley employed Mr. Campbell regularly over the years to cut demos of songs that the one-time King of Rock and Roll might be recording. Now before you get super excited, realize that these recordings were made during the 1960s so some of tracks you'll hear here ended up in Elvis' movies. And... as many of you may know those are some of the King's most reviled recorded efforts. But, in the hands of Glen Campbell, those songs take on new life and that is exactly where the fun begins with this release. 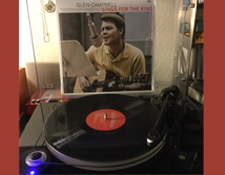 Glen Campbell Sings For The King is remarkable in its presentation of this music as Elvis might have sung it. Campbell, it turns out was friends with Elvis so he knew the man and his mannerisms well. There are points on this recording where his impressions of Presley's delivery are downright uncanny! This was never more apparent than on the touching album opener "We Call On Him" a 1967 Gospel-flavored song which has been presented as a duet with Presley (and thus perhaps marking the first time Elvis has appeared on a Capitol Records release, at least as far as I know!). Its uncanny, I tell ya! Things pick up after that somber moment with jaunty ditties like "Easy Come, Easy Go." Its not all fluff here however -- acoustic based songs like "I'll Never Know" and "All I Needed Was The Rain" could easily have been recorded by Roy Orbison as well as Elvis Presley. The standard weight vinyl pressing sounds pretty solid -- it is well centered and sounds good and not overly compressed even though there are 18 tracks on the album! My copy had a wee bit of periodic surface noise but that seemed to be reduced significantly after a second round with my trusty old Discwasher. I may fully wash the album sometime, but for now this is fine. I didn't hear anything that was getting seriously in the way of the music. These recordings were transferred from original analog tapes and they sound real good and warm because of it. 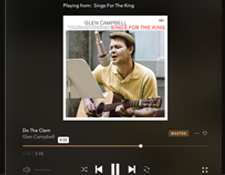 Actually, beyond the vinyl, perhaps the bigger joy for you Dear Audiophile Review Readers who are also fans of Tidal and the MQA format is that you can stream Glen Campbell Sings For The King there in 192 kHz, 24-bit fidelity! (click here to jump to it). This is a quite terrific sounding stream. Richer flavored songs like the light bluesy-country of "There Is So Much World To See" and 'Cross My Heart And Hope To Die" more than make up for the ridiculous pablum of "Clambake" and "Do The Clam." Just reading that back I cringe a bit at the somewhat preposterous notion of talking about the audiophile benefits of a goofy song like "Clambake" but, hey, its part of the early 60s Elvis experience. So... yeah.... trust me... you haven't really lived until you've heard the bongos on "Do The Clam" in 192 kHz, 24-bit fidelity. Bongos and Elvis and Glen Campbell.... oh my! !